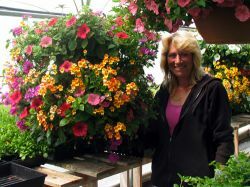 Sunset Pines Greenhouse provides plant products and services for Prince George. At Sunset Pines Greenhouse, we have a combined experience of more than 50 years in the commercial horticulture industry. We provide exciting, unique quality plant products and services for Prince George and surrounding area. Since 2007 we have provided some of the finest and most unique custom planters and baskets for various commercial businesses and residential customers alike. As professionals in our industry we source the latest trends, best quality, and value of plant material and seeds to ensure you receive the finest plant material available on the market today. In order to increase your growing pleasure we offer cultural tips and workshops too! Our planter and basket material is supplied to us as plugs while our pack material is grown from seed. We only use Proven Winners® brand for all our baskets, planters and basket stuffers. Our seed is selected from various reputable suppliers in BC and across Canada. With our more than 6,000 square feet of greenhouse space, we can custom make your hanging baskets and planters to suit your color schemes. Or choose from the hundreds of ready made vibrant baskets, or pick out your own “stuffers’ and let your creative juices flow! If its vegetables starters you are after come check out our great selections, everything from asparagus to zucchini! Or if you just want some freshly picked produce we provide that too! If its quality and value, you can rest assured that we grow what we sell, and we believe this guarantees that you will be more than thrilled with the results!